Colin Campbell Cooper, Jr. was born in Philadelphia, Pennsylvania on March 8, 1856 into a well-to-do family of English-Irish heritage. He had four older and four younger siblings. His mother, Emily Williams Cooper, whose ancestor emigrated to the U.S. from Weymouth, England, was an amateur painter in watercolors. His father, Dr. Colin Campbell Cooper, whose grandfather came from Derry, Ireland, was a surgeon and a lawyer with a great appreciation for the arts. Young Colin had been inspired by the art which he discovered when he attended the Philadelphia Exposition of 1876. Both of his parents were highly supportive of his ambitions, encouraging him to become an artist. In 1879, Cooper enrolled in the Pennsylvania Academy of the Fine Arts in Philadelphia, studying art under famed controversial realist painter Thomas Eakins for three years. In 1886 he embarked on the first of his many travels to foreign lands, visiting the Netherlands, Belgium, and Brittany. Afterwards, his art education resumed at the Académie Julian in Paris from 1886 to 1890, with Henri Lucien Doucet, William-Adolphe Bouguereau, and Jules Joseph Lefebvre. He also studied at Académie Delécluse and Académie Vitti. His work of this period consisted mostly of landscapes painted in a Barbizon manner. He traveled extensively throughout his life, sketching and painting scenes of Europe, Asia, and the United States in watercolors and oils. Back in Philadelphia, Cooper taught watercolor classes and architectural rendering at the Drexel Institute of Art, Science and Industry (now Drexel University) from 1895 to 1898. 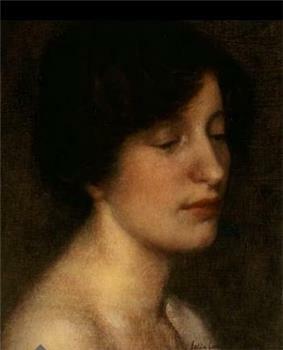 Many of Cooper's paintings were destroyed in an 1896 fire at Philadelphia's Hazeltine Galleries; as a result, relatively little of his early work exists today. While at Drexel, he spent his summers abroad, primarily in the Dutch artists colony of Laren in North Holland and in Dordrecht in South Holland. Among the other artists in Dordrecht at this time was renowned painter Emma Lampert (1855–1920) from Rochester, New York. She and Cooper met, and were soon married, in Rochester on June 9, 1897. In 1898, the Coopers returned to Europe for a few years. During this period, as Cooper painted architectural landmarks, he developed the Impressionist style which he used for the rest of his artistic career. Hudson River Waterfront, N. Y. C.
Cooper and his wife exhibited together in several two-person shows, including a May 1902 exhibit at the Philadelphia Art Club and a 1915 show at the Memorial Art Gallery in Rochester. They moved in 1904 to New York City, where he would remain, other than his many travels, until 1921. Here he continued work, which he had begun about two years earlier in Philadelphia, on his famous skyscraper paintings. Cooper said that he was "greatly interested in the skyscraper buildings in Broad Street. It was intensely interesting to watch the freakishness disappear from those queer towering structures in the glory of the right kind of light". He said that the painting which first brought him great success was 1902's Broad Street, New York; in 1903, this painting was honored with the W. T. Evans Award of the New York Watercolor Club. In another interview, he had stated that "one of the points that most strikes me about this view up Broad Street is the dramatic contrast between the old, low type of buildings ... and the great skyscrapers. My pictures are built on these contrasts." 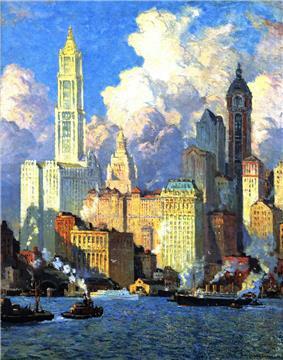 In 1911, The New York Times, citing Cooper as the artist who best captured modern, towering structures on canvas, declared him to be "the skyscraper artist par excellence of America". In an article the following year, they stated that he was "one of the most interesting figures in American art", reiterating that "in his particular field he has no superior". In addition to New York City, his paintings often depict skyscrapers in Philadelphia and Chicago. Cooper's painting Fifth Avenue, New York was purchased by the French government for the Musée du Luxembourg. Such an honor was quite rare for an American artist. 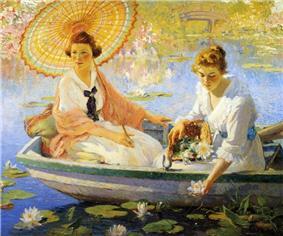 Critics at the time, and up to the present, frequently compared the works of Cooper and Childe Hassam. They have often been credited as being the two most iconic artists whose paintings began a trend of celebrating the wonders of the modern city, especially New York City. Cooper may have intentionally avoided certain subjects in order to differentiate himself from Hassam. Hassam, unlike Cooper, did not concentrate on the tall buildings in his cityscapes. Cooper was as proficient painting in watercolors as he was in oils. He would often create a small watercolor study before painting a larger work of the same subject in oils. But the smaller watercolors were not mere sketches for his own use; they were finished pieces which he exhibited, sometimes years earlier than the larger corresponding oil paintings that he would ultimately produce. Cooper was elected to a prestigious membership in the National Academy of Design in 1912 (he had previously been elected an Associate, four years earlier). He and his wife were aboard the RMS Carpathia during its rescue mission for the survivors from the sunken RMS Titanic on April 15, 1912. He assisted in the effort, and during the rescue operation, he created several paintings which document the events. The Coopers gave up their ship's cabin so some of the survivors would have berths to sleep in. Cooper exhibited in San Francisco's Panama–Pacific International Exposition of 1915, winning the Gold Medal for oil and the Silver Medal for watercolor. 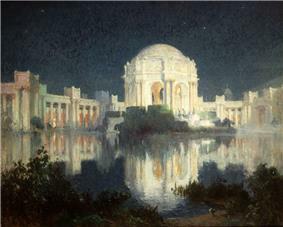 While there, he created a series of paintings depicting the exposition's buildings, including the Palace of Fine Arts. He also participated in the Panama–California Exposition in San Diego in 1916. The Coopers spent the winter of 1915–16 in Los Angeles. This time in southern California was undoubtedly a key factor in Cooper's later decision to move there permanently. His wife Emma died of tuberculosis on July 30, 1920. After his wife's death, Cooper moved to Santa Barbara, California in January 1921. Santa Barbara would be his home base for the rest of his life, spending two years in northern Europe and Tunisia. He became Dean of Painting at the Santa Barbara Community School of Arts. Cooper said of his new environment: "I find Santa Barbara so conducive to the sort of things a painter most craves – climate, flowers, mountains, seascapes, etc. – with a community interest in all sorts of artistic matters that I am compensated, to a degree, for the isolation from that artistic universe of America." But he hadn't abandoned that "artistic universe of America", New York City, as he continued to maintain a studio there for ten years after his move to California. Another aspect of his creativity became evident starting in the mid-1920s, as, perhaps influenced by his father's great love of literature, he began writing plays and books. His plays found their way in the 1920s and 1930 to theater companies in places such as Pasadena, Redlands, and Santa Fe, and were also produced at a theater which he founded in Santa Barbara, called The Strollers. In addition to the plays, he also wrote novels, illustrated books, and an autobiography entitled In These Old Days. In April 1927, he married his second wife, Marie Henriette Frehsee, in Arizona. Cooper continued to enjoy traveling, and kept painting until prevented from doing so by failing eyesight in his last years. He died in Santa Barbara on November 6, 1937 at the age of 81. In 1938 Santa Barbara's Faulkner Memorial Art Gallery paid tribute to Cooper's legacy by presenting a memorial exhibition of his work. Nocturnal Town Square a.k.a. European Plaza. Oil on board. James Hansen Santa Barbara, California exhibition, 1981. Private collection, USA. 2006 East Coast/West Coast and Beyond: Colin Campbell Cooper, American Impressionist, retrospective; originated at Heckscher Museum of Art (Huntington, New York), traveled to Laguna Art Museum (Laguna Beach, CA) in 2007. ^ a b Westphal, p. 59. ^ a b Gerdts, p. 13. ^ a b c d e f Dearinger, p. 114. ^ a b Gerdts, p. 14. ^ a b Lowrey, p. 74. ^ a b Lowrey, p. 75. ^ a b Hughes, p. 115. ^ a b Westphal, p. 58. ^ a b Gerdts, p. 25. ^ a b Westphal, p. 61. ^ a b Gerdts, p. 38. ^ a b c Gerdts, p. 103. 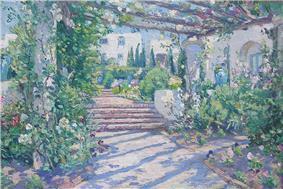 ^ An Exhibition of Paintings by Colin Campbell Cooper, James M. Hansen, Santa Barbara, California, May 3–16, 1981. Painting number 135 in the catalogue.